Well!! 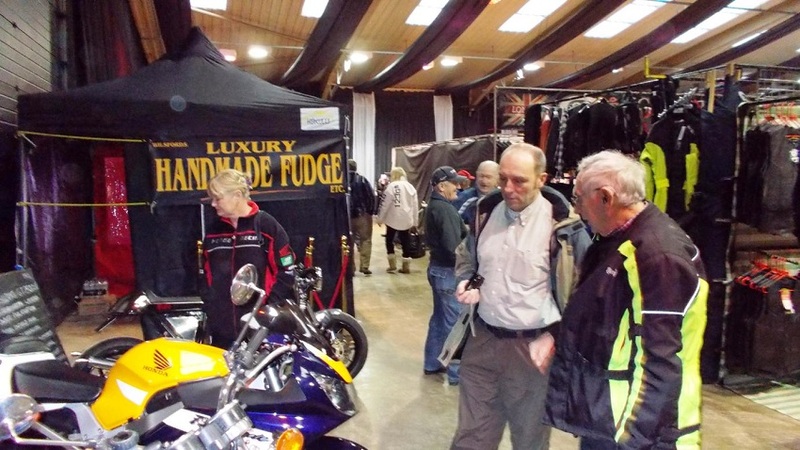 What a great start to the year – two motorcycle shows both in January and fairly close to me at Sleaford. 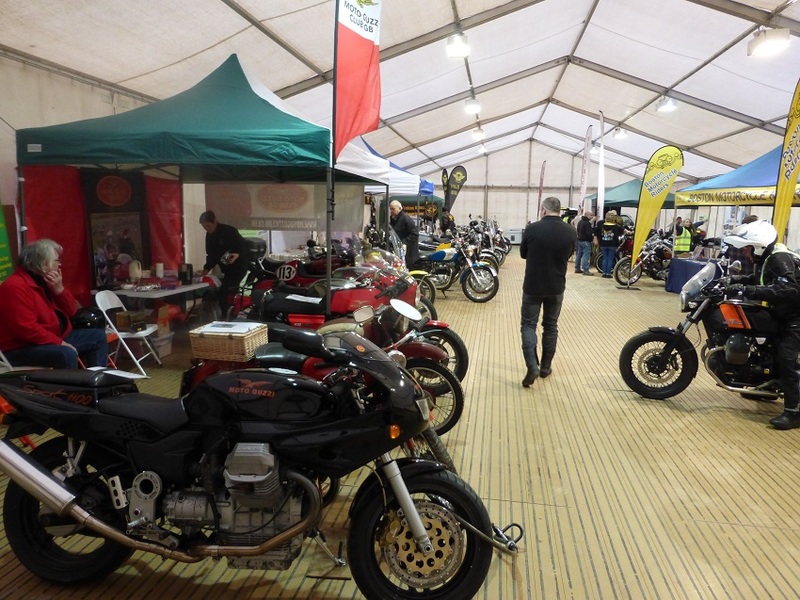 The Springfield Show is held alongside the Springfield Shopping Centre just off the A16 near Spalding. 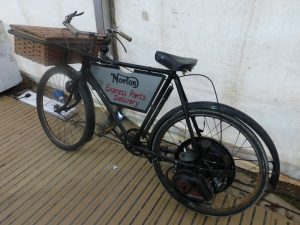 The show starts at 10.00 am; however the café is open at 9.30 am, which is handy for a warm up after you have ridden there. The entrance fee is £7 for an adult, but if you look on the show’s website you can down load a £1.00 entrance discount, which is even better. Martyn and I enjoyed a cuppa and a breakfast before we wandered in to see the exhibits. 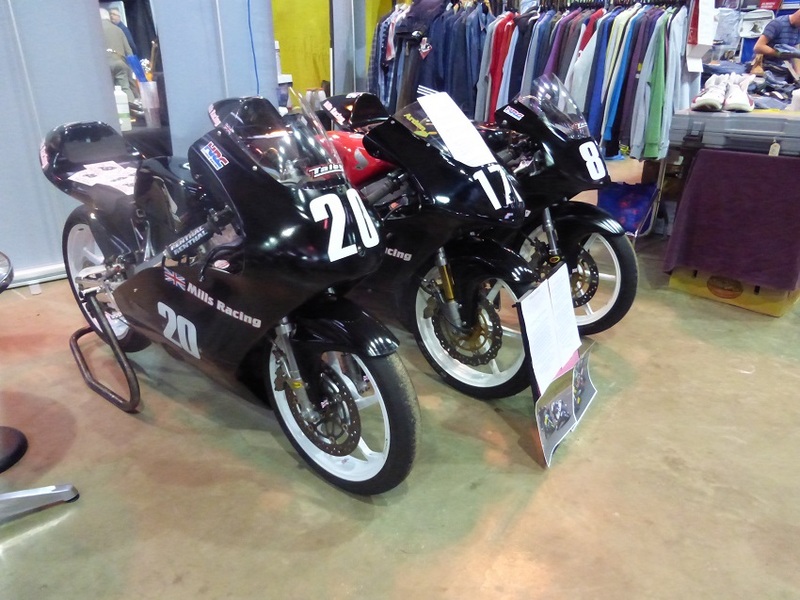 There are three halls under cover, filled with motorcycles, trade stands, various clubs and plenty of riding kit for sale. In one hall we bumped into Jonathan Bourne; he belongs to MAG and was helping on their stand. We all got into a conversation about different rallies and campsites and modifications to their motorcycles. 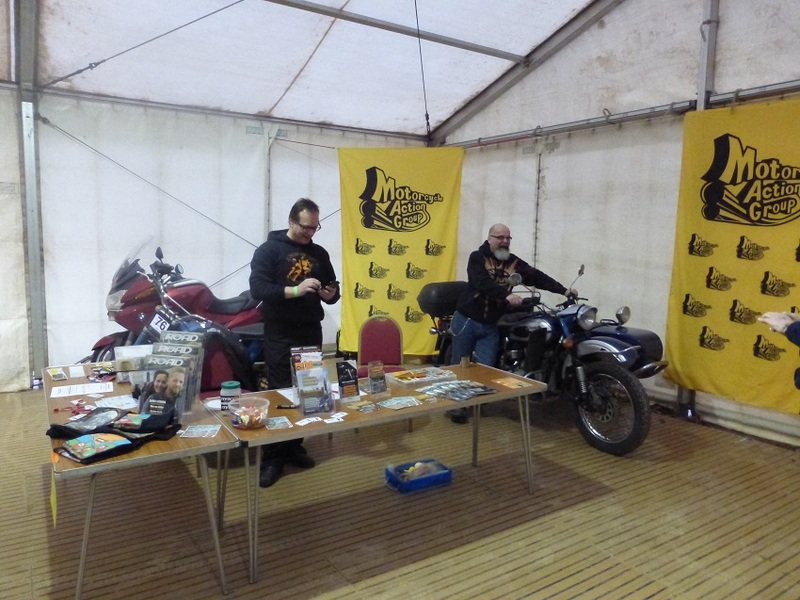 Jonathan is known to some of you because he organises the motorcycle section of the Swaton Vintage Show. 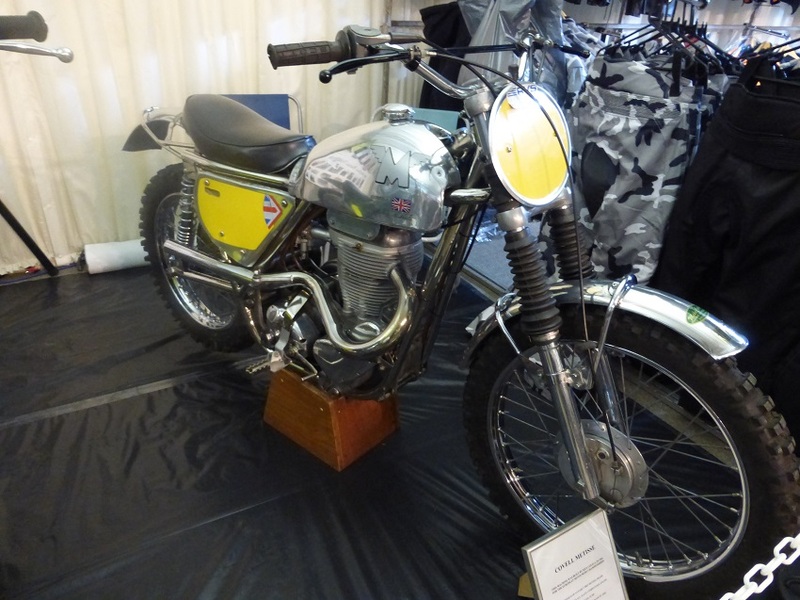 Opposite his stand was the Moto-Guzzi Club’s stand and leaning against a wall was a pushbike with an engine in the back wheel. 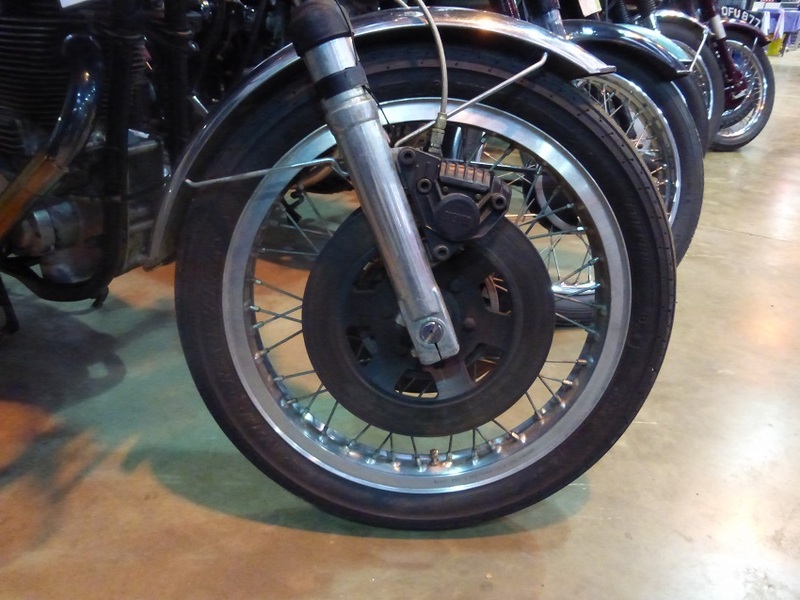 I felt it was a BSA Winged Wheel, but the owner told us the engine was, in fact, a Cyclemaster. On both of these models the rear wheels were just replaced by a driven back wheel; you had two simple controls for the engine, and away you went. The Cyclemaster Company claimed that their version had a top speed of 20 mph and petrol consumption of 250-300 mpg. 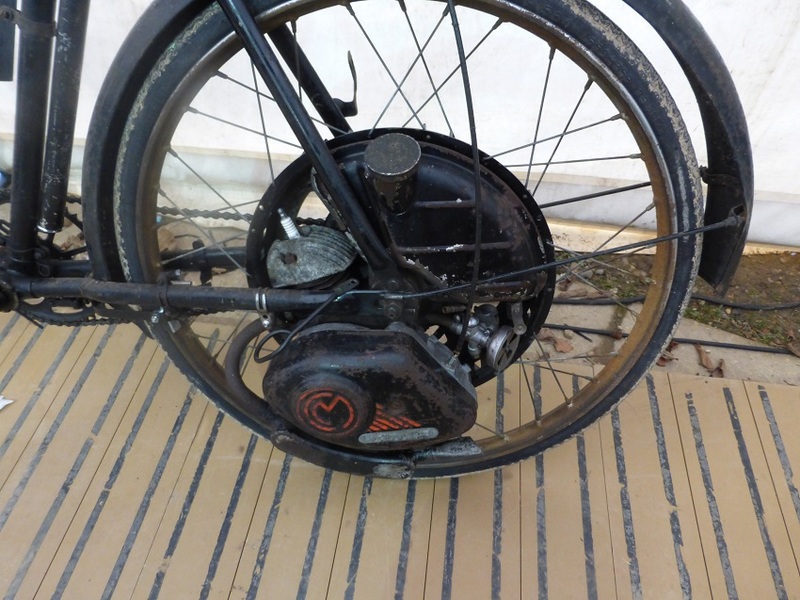 The Cyclemaster was chain driven so it worked well. 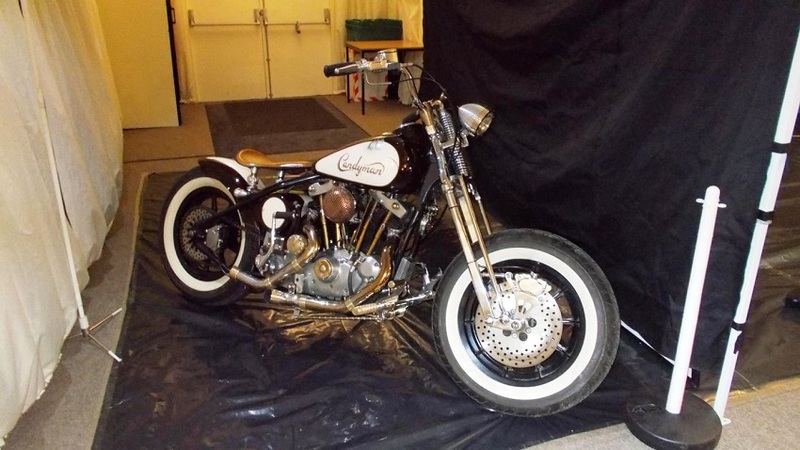 These, and other makes of engines, were very popular just after World War II, and they were forerunners of the moped. 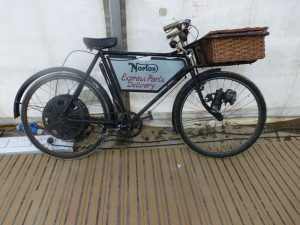 The owner of this particular bicycle paid £75 for it, and he then spotted the motorised wheel in an antiques shop, where he gave the shop owner £100 for it. 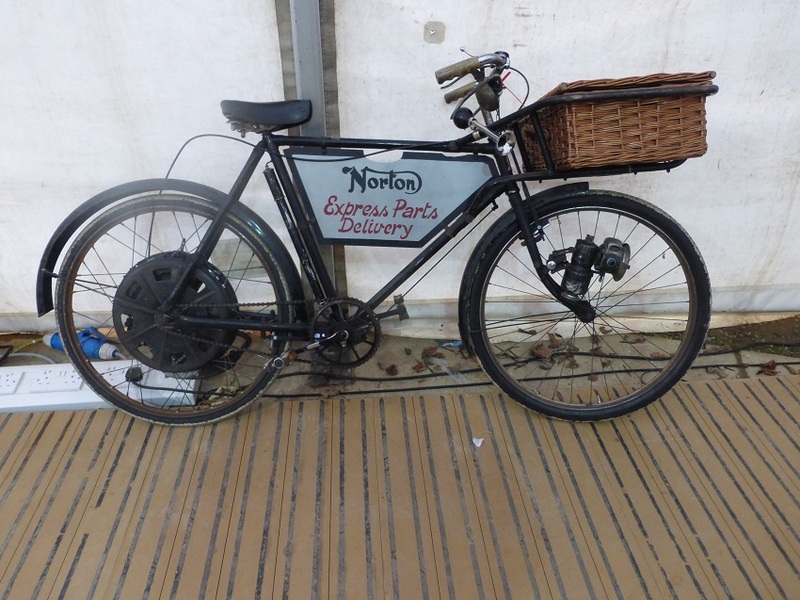 This motorised bicycle will be running in time for next year’s show, we were told. 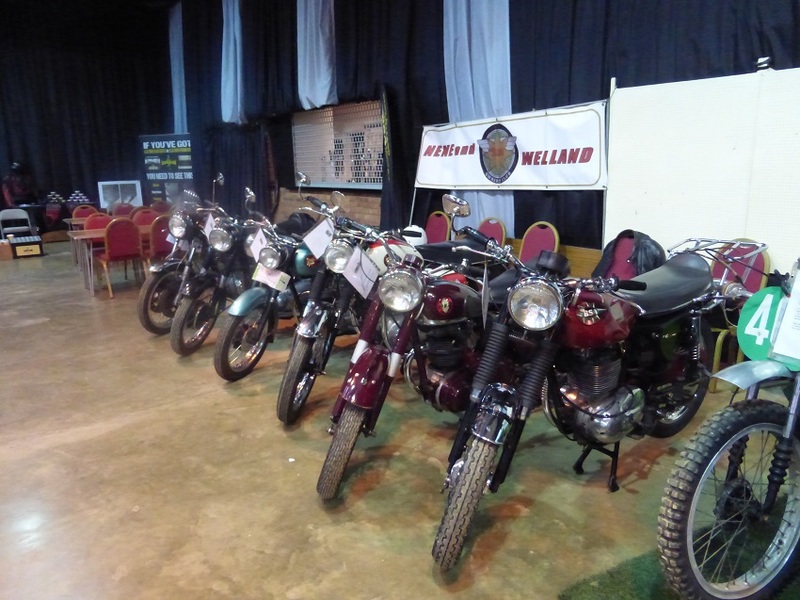 Another hall had a nice selection of classic bikes. 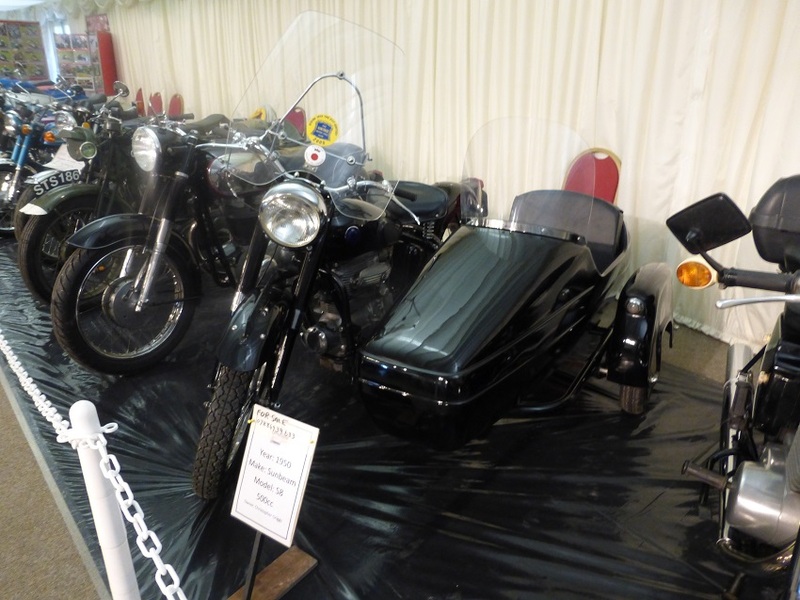 The organiser of the classic’s section was pleased with the display; however he told me that years ago some major motorcycle manufacturers would bring along displays of their current machines, and he felt that it would be nice if this were to happen again. 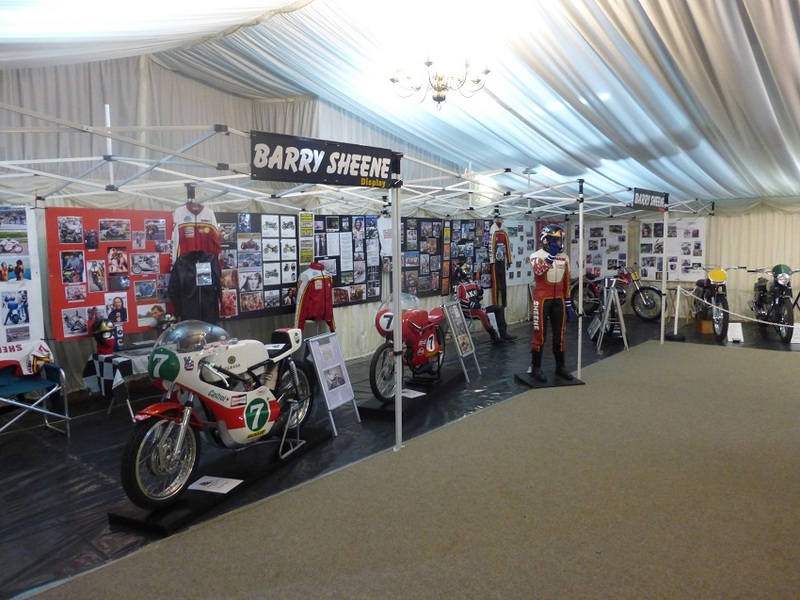 In the same hall someone had put together an excellent display about Barry Sheene; looking at the size of his leathers I realised that he was quite a small chap. They were also screening film of him racing, and this drew quite a crowd. Martyn and I returned to the café again for an early lunch; lucky we did so, because by the time we had finished the tables were pretty full and people were queuing out of the door. The food was good and reasonably priced. 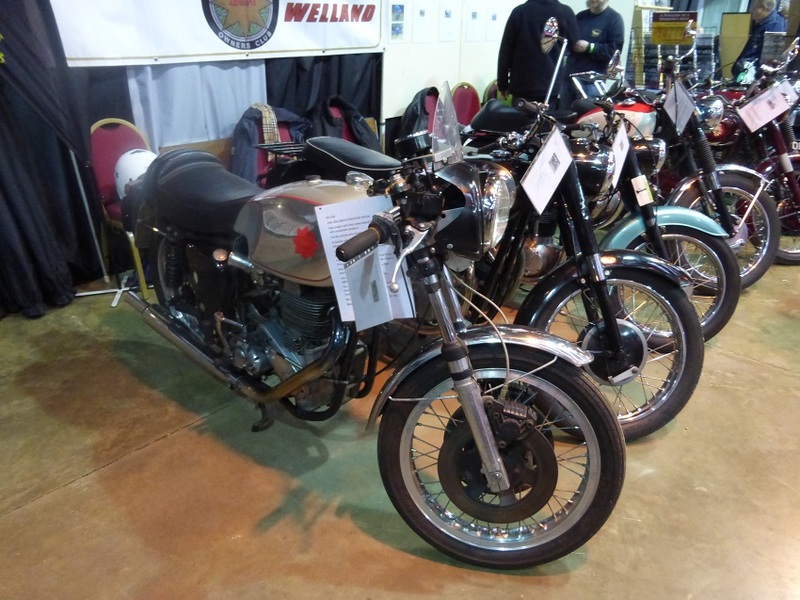 Nene and Welland BSA Owners’ Club are regulars at this show, and, as usual, they had a good display of machines to look at. 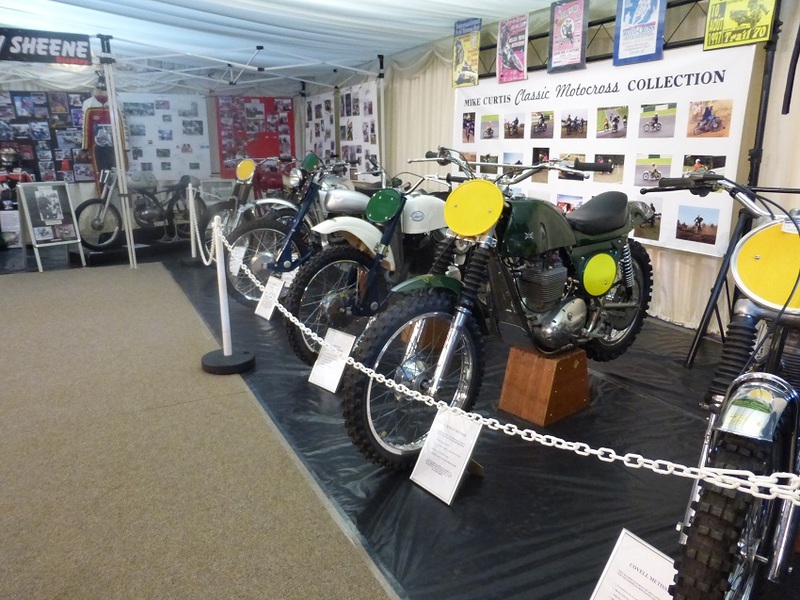 Mike Curtis had his classic motocross collection on display, and one particular Matchless caught Martyn’s eye. 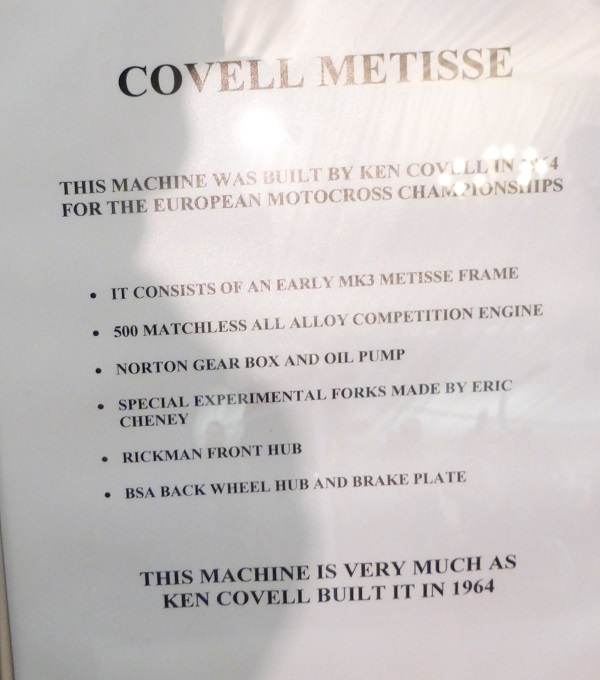 The reason it court my eye Roy was the fact it was built by Ken Covell. Ken owned and ran a motorcycle shop in Ely for several years, he was also a decent Motocross rider and good friends with Andy Lee another successful motocross rider of the time Ely Standard . Lesley and I have both purchased bikes from Ken and Andy. Andy Lee’s son, Michael Lee was one of the most gifted speedway riders seen during the late 70’s and 80’s, British Champion and World Champion, but is career was abruptly or effectively ended over a controversial incident Michael Lee. 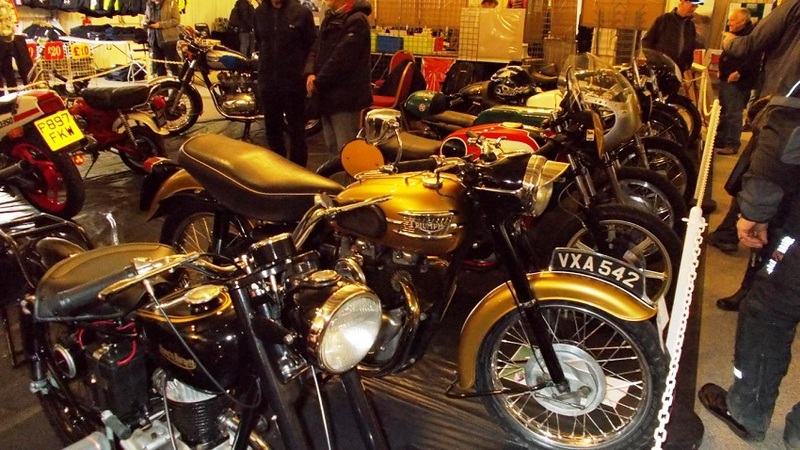 This is a nice local show, with a good mix of motorcycles from classics, custom, and racing and plenty of trade stands. It was good to catch up with some old friends. I will be back next year.